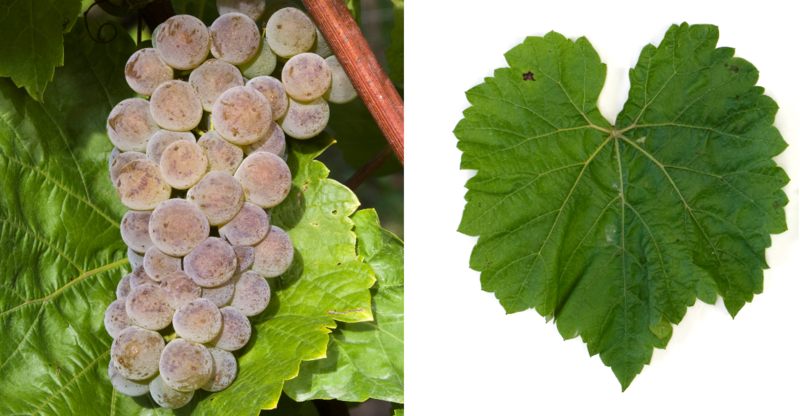 The white grape is an interspecific new breed between Elmer Swenson 114 ( Minnesota 78 x rosette x Seyval blanc, Synonyms are Elmer Swenson 294, ES 294 and Lacrosse. The name was assigned to the eponymous city in western Wisconsin. They are genes of Vitis labrusca. Vitis lincecumii. Vitis riparia. Vitis rupestris and Vitis vinifera contain. By the way, with the same parents is also the new breed St. Pepin emerged. The intersection of hybrid took place in 1971 by the American breeder Elmer Swenson (1913-2004) near Osceola, Wisconsin. Of the variety protection was granted in 1983. The early ripening and to minus 29 degrees Celsius hardy Vine is particularly vulnerable to black rot and Botrytis, as well as against both mildews, She provides fruity White wines with a variety of aromas of pears, apricots and citrus fruits, which are mainly used for blending. She is also called table grape and for the production of grape juice used. The variety is mainly in the Midwestern United States in the States Illinois. Iowa. Minnesota, Nebraska, Nevada. Ohio. Pennsylvania, South Dakota and Wisconsin grown. In 2010, a total of 25 hectares of vineyards were reported in the US (Statistics Kym Anderson ). This page was last modified at 28 January 2018 at 16:18.